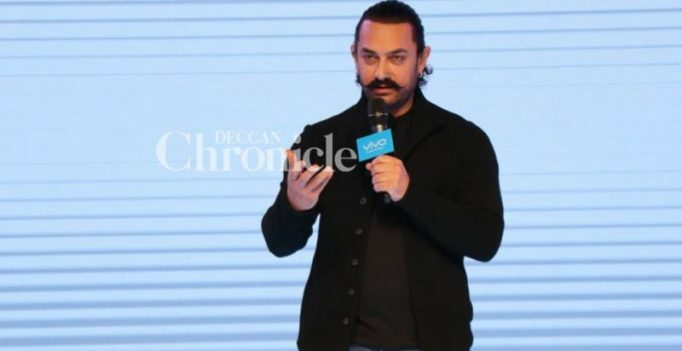 Mumbai: Superstar Aamir Khan says he thinks of himself as a learner who has a curious mind. “I see myself as someone who is trying to learn. Each film I try to do, whether I do a film, do something for Paani Foundation or ‘Satyameva Jayate’ (TV show), it is a journey for me. “I see myself as a learner, someone who has got a curious mind. I am a student of whatever I am dealing with and everything is new to me,” Aamir said here at an event on Thursday. The actor may give the impression of being an organised person, but said in real life, he is chaotic. “I get lost in my head. When I sit in a meeting, it is usually for an hour, but it goes on for two hours or so. And then I remember there is something else I have to do. So my day becomes longer. I get lost in my work,” he said at the launch of Vivo’s new smartphone. Aamir will be next seen in ‘Thugs of Hindostan’ where he is sharing screen space with Amitabh Bachchan for the first time. The actor said working with the megastar was a dream come true. “I have been a huge, huge fan of Mr Bachchan all along. The first day of rehearsals, when we were sitting and reading scenes together, it was a fanboy moment for me. “I couldn’t speak properly, I couldn’t remember my lines, I was going all over the place. It has been a real joy for me everyday that I have sat next to him while we were shooting,” he said. The action-adventure film, directed by Vijay Krishna Acharya, is set to arrive in theatres on November 7.